With the barbel on the munch and the chub becoming increasing shy I've been waiting for a storm - perhaps a bit of colour in the water would turn the tables in the chub's favour. I was going to concentrate on two swims where I've seen chub and barbel recently - the first cast sat out for all of 2 minutes before the rod slammed over - a chub about 3lb - good old dirty water! I added a few free samples and left the swim to rest while I fished the second swim. Again the cast sat out for about 2 minutes before slamming over - I struck and there was a loud BANG as the rod shattered and the line went slack. 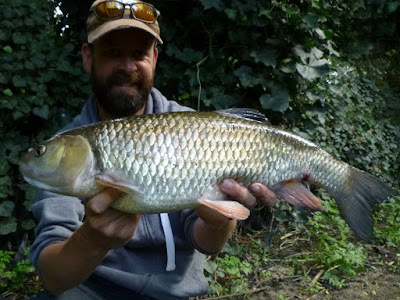 The line pulled tight and I thought I was connected to a small barbel - until I saw a good chub turn in the dirty water - with my heart in my mouth I carefully played the chub in with what was left of the rod and breathed a sigh of relief when she slid over the net. A fantastic 5lb 2oz chub, my best of the season so far and equalled my best from the river. And after less than 15 minutes of fishing and only 2 casts my session was done. 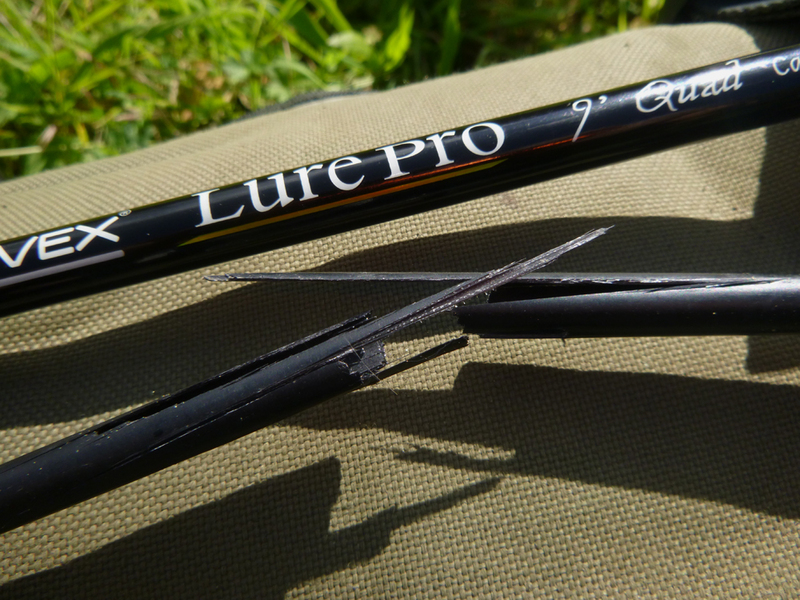 I'm not too gutted about the rod - the Rovex Lure Pro Quad - I use these in various lengths for about 90% of my fishing, virtually all my chub and barbel fishing, light lure fishing even a livebait or little deadbait. Light, great action, four piece that makes it really easy to transport on the bus or tube and relatively inexpensive - I buy them and use them to destruction - this one must have landed hundreds of pounds of fish - I'm glad it had a Viking death!! The title should have been named Hallelujah ! Can't ever recall breaking a rod while playing a fish, it's usually been when casting heavy gear out. Cheers, been watching them for a while - great to finally land one. 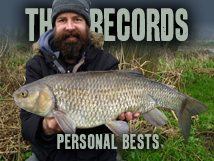 I've broken a few rods while playing fish, I remember a barbel where the rod broke just in front of the reel - lost fish. And a big predator in Africa where the rod shattered into about 20 pieces - lost fish.